If you travel with young kids, you’ve been faced with this dilemma – the car seat. What do you do with it? Check it or bring on board? Bring from home or rent? Recently, we welcomed the Weelee made by Clek into our family. And it has been a VERY welcomed addition. If your kids are under 2, during plane travel, you have the decision of paying extra for a seat or have your child sit on your lap. This decision impacts what happens to your car seat. During our travels, we’ve both bought an extra seat for our under 2 year old and travelled with him on our lap. Our decision is based on the price of the ticket, length of flight, and our travel day. For us, the longer the flight, the more likely we are to purchase an extra seat so we can bring our car seat on board. But, sometimes we choose to take our infant on board the plane traveling on a lap. Tip: If you plan to purchase a seat and bring a car seat on board, be sure to check your car seat. It must have a proper air travel sticker on the bottom/back. The Foonf is approved for air travel. For many, buying an extra seat is not always an option. Therefore, you must check your car seat (we recommend that you always bring your own, do not rent. You can read why here). 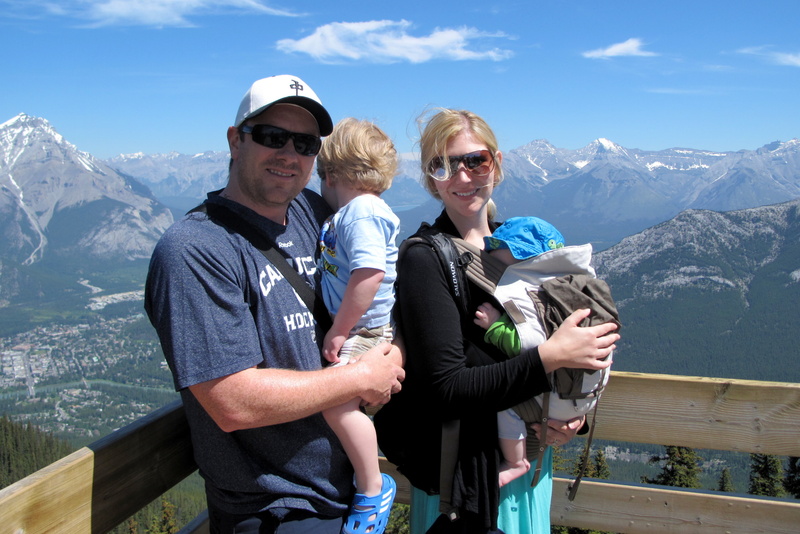 This is where the Weelee is an awesome addition for any traveling family. The Weelee is made to protect your car seat. It has thick extra padding all around, sturdy wheels for easy transport, a telescoping handle, durable nylon canvas construction, and fits our Foonf perfectly. 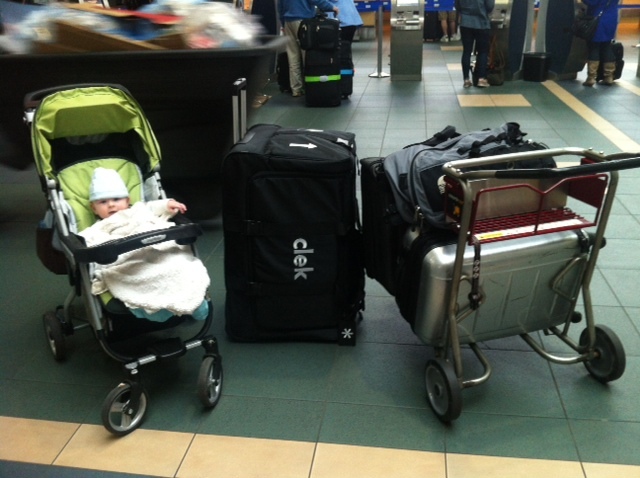 But for those without a Clek car seat, it’s a universal travel bag that fits most leading brands of car seats. 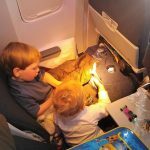 What do we do with our car seat for plane travel? With our first child we would take our car seat and check it with our luggage. Our airline would put a plastic bag over it and away it went. We would pick it up with our luggage when we arrived at our destination. Many times the bag was ripped and our car seat was dirty. It was not ideal. We then tried gate checking it, thinking that it would be more protected in the special compartment for strollers. But on full flights with a lot of strollers, our car seat was often moved from the gate check compartment down into the underbelly with the bags. We would be told upon exiting the plane that our car seat could be found with our luggage. The same situation happened – ripped bags and dirty car seat. Since owning our Weelee we have flown on over 10 flights. We check our luggage bags along with our Weelee when we get to the ticketing counter. 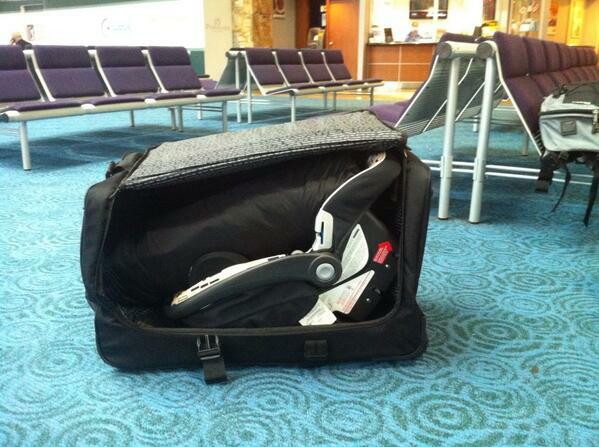 We have never been charged for our Weelee travel bag and it’s held up extremely well. Our precious Foonf has been kept in perfect condition. Tip: The Weelee is big. This allows a couple extra items to fit in it (see picture above: we added our travel bed). We also use the extra space for diapers, a travel chair, and beach gear. We have been told by some people that car seats should never go under a plane with the luggage. And yes, ideally when traveling with a baby under 2, it’s best to have them in a car seat on the plane since it is proven to be the safest method for plane travel. But many people do not fly with an infant strapped into a car seat or they might be traveling with an older child who still requires a car seat at their destination. Therefore, traveling with the Weelee is a great option since it helps minimize damage to the car seat. 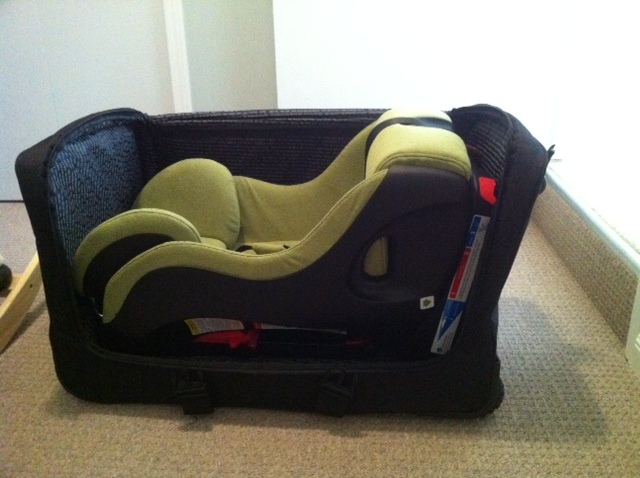 Investing in a good car seat is very important to us and keeping it in perfect condition while in transport is crucial. We would rather bring our own car seat with us and protect it as best we can versus renting at our destination. 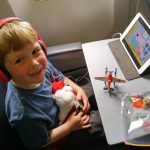 And for those who choose to pay for the seat so they can bring their car seat on board the plane, the Foonf is a great option. It’s very narrow so it fits perfectly on the plane’s seat and it is approved for air travel. 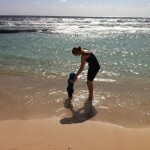 Do you travel with young children? What are your thoughts on car seats? Share your feedback in the comments section below, we’re always looking for advice from other traveling families. 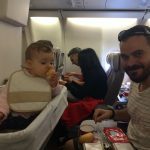 What’s up,I check your new stuff named “Traveling with a Weelee | Tips for Baby Travel” like every week.Your writing style is witty, keep it up! And you can look our website about proxy site. Your page has been very helpful. We are planning a trip to Hawaii this June with our first born. She will be 9 months at the time of travel. We are debating on either staying on Maui or Honolulu. 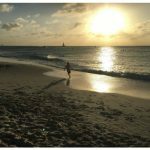 If we visit Maui we will stay at the Kanippali Beach Hotel or the Outrigger Waikiki on the beach in Honolulu. Did you take your baby on a boat while in maui? And is it usually free of charge to check in weelee bag with the car seat during the airplane flight (even though I put some extra stuff into the bag)? Thank you for this tip! Very helpful! What abou the stroller and the bassinet? 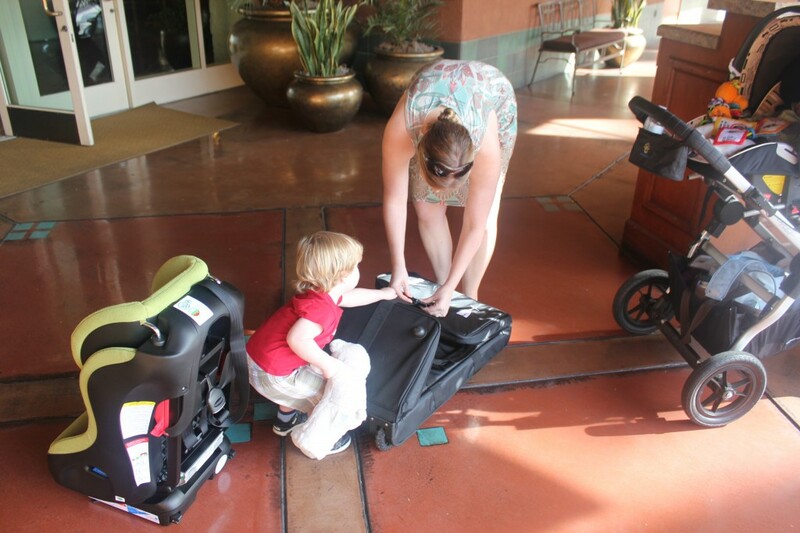 How do you usually wrap the stroller, so ig stays safe even at the gate checking? We are planning a long distance trip from Canada to Europe with 1-month baby and I’d loe to take the whole travel system but I’m very worried that the new stroller (Peg Pegero) will be destroyed right after the purchase.